It’s all the caviar we get here at Hackaday! The ESP8266 costs about $2. This doubles the price? So, how much it costs? $4? Same chip as in the Hame A15 which is about $7 delivered, and has ethernet, usb socket and a cheap case. Only 4M of flash though which is painful. 19,99 usd for the board itself. If you want the “dock” to be included, 49,99 usd. But people got them cheaper back when the indigogo project was there. (check alixpress for the same ic on a similiar board. There are some updated docks comming. Audio, camera… also drivers for hardware like tft screens. But ESP8266 could be enough for cheap projects. Why am I paying $45 for this(that’s what it costs for the version with ethernet – it’s a not a router if there are no interfaces)…versus a $30 Raspberry Pi which has more computing power, has a similar number of GPIO, runs standard linux distributions practically out of the box, has multiple USB interfaces, etc? Yeah, I agree. The Domino Pi basic kit is much more affordable at $24, and basically the same thing. Smaller, cheaper, and with WiFi. Probably uses less power than a Pi as well, but I’m not sure. You’d use this module if you were going to integrate it into another design. In that case, it’s probably _more_ convenient to wire up your own USB ports or Ethernet phy because you don’t have to worry about the module’s footprint. If you fit a Pi into your project, you have to design the physical shape of your device around the Pi’s interfaces. Picked one up and you hit on most of the points why I wanted vocore over the PI. I don’t need all of those outputs but the few I want will be connected directly to the vocore. One you missed is that this thing is running ddwrt. A prior poster called it a limitation but for those of us that wanted the router functions it’s a selling point. This thing might be niche but it has a market. The VoCore is a great little board. I have done Emulators, doom, streaming webcam, and various other things with it. Seems a year or 2 late for a getting started though . Got links for us?! We’d love to see some more. 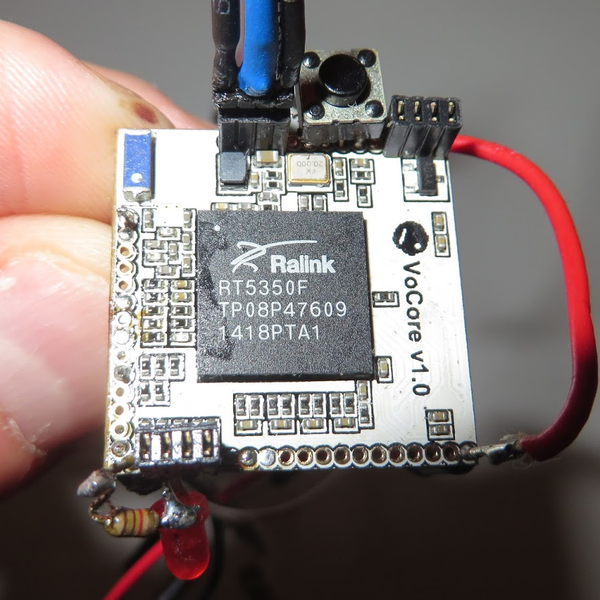 How does this compare to the RT5350F-OLinuXino? Has anyone played with that one? Why not just use a spare TP-Link (or whatever) router? Isn’t that a little bit big in comparison?